The best thing about deciding that comfort food is going to be the star of your dinner table is that anything goes 🙂 My usual choice for comfort food is PASTA. Pasta is a once-in-a-while treat for us. 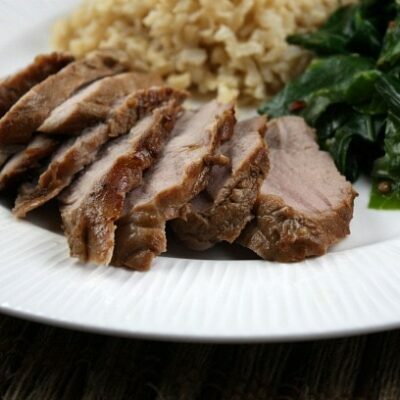 For the most part we avoid eating it a lot at home, saving the carb-loving splurge for dinners out instead. I almost never order mac and cheese at a restaurant for fear of coming home a couple pounds heavier, but for some reason it feels okay to make it at home. Last weekend called for comfort food. It was snowing lightly, and we were feeling like a good macaroni and cheese, comfort-food type dinner might warm us up just right. 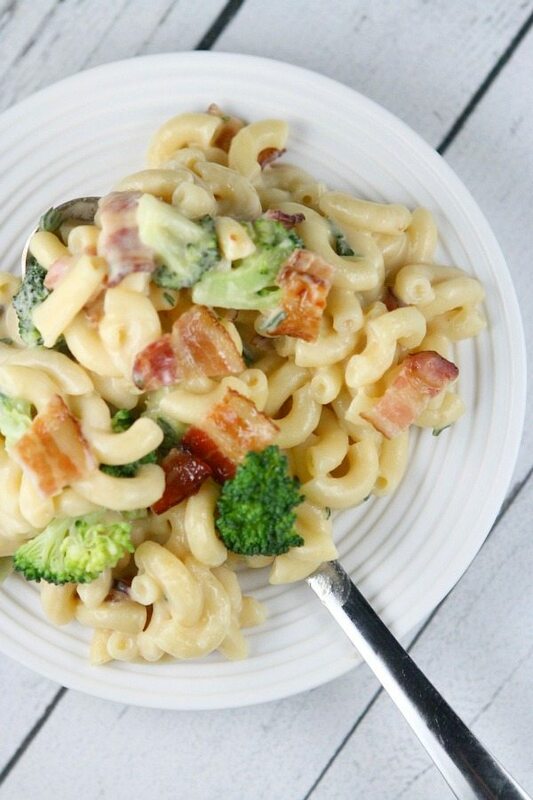 This version of mac and cheese sports a simple cheddar cheese sauce (though you can use any cheese you’d like), and a generous amount of broccoli florets and crispy bacon. It’s creamy and perfect. It’s pure comfort food indeed! This dinner warmed us up and filled our tummies with the pasta (and bacon) that we crave so often. It’s not over-the-top indulgent but it’s comforting, and it was a big family hit. Try using a combination of your favorite cheeses in place of the cheddar cheese. 1. Cook pasta according to package directions. Add broccoli during the last two minutes of cooking. Drain. 2. In a medium bowl, whisk together the milk, Dijon, Worcestershire and thyme. 3. Melt the butter in a medium skillet over medium heat. Whisk in the flour and cook for 1 minute. Whisk in the milk mixture, and bring to a boil. Keep whisking until the mixture has thickened a bit. Whisk in the cheese and stir until melted. 4. 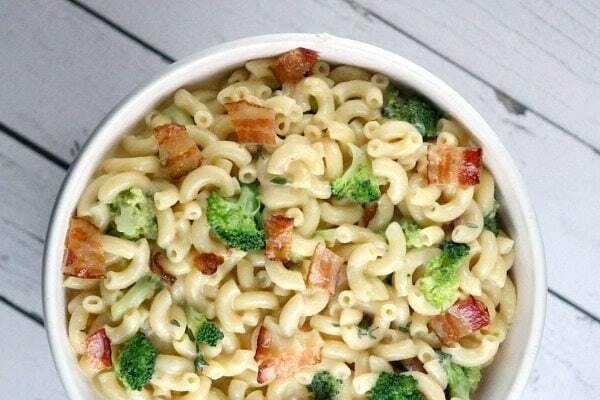 Stir the pasta/broccoli and bacon into the sauce. Spoon into dishes and serve immediately. I used “most” of your recipe. But I like to try most anything new…so I did. I Did not use bacon. I used a manufactured box mac and cheese with rotini (9.4 oz size). BUT (you will see that so much) I added one cup uncooked penne. I mix things up so much as well. Added jalapeno pepper–three small ones chopped, and 1 teaspoon of minced garlic (again the store bought kind–don’t have a way to make fresh, yet). Used the package that came in box (not that powdered kind…real cheese-according to box) I also added unsalted whole kernel corn (from a can). the rest is pretty much as you have in recipe. I have to say it was good. 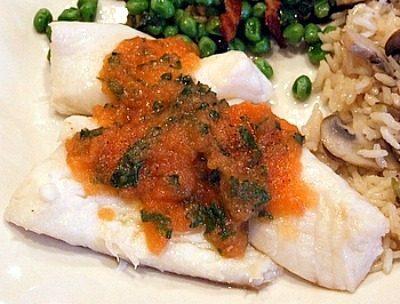 Never would have tried unless you had this recipe. 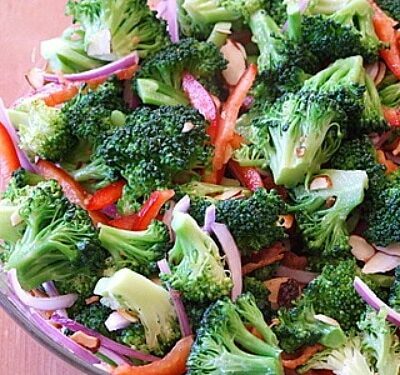 Love the fresh broccoli and the zest of the peppers and garlic. Just wanted you to know…..hope this does not upset the cart….. I made this and thought there was way too much Dijon mustard. It really took over the whole dish. Thanks for the feedback. My family enjoyed the strong flavor, but I’ve adjusted the recipe to call out 2 to 4 teaspoons, so others can adjust for flavor preference. 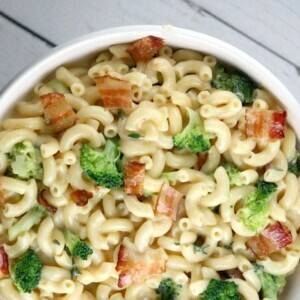 My husband and I made your Bacon and Broccoli Macaroni and Cheese last night and really enjoyed it. I used a med. cheddar cheese, but may use sharp next time (there will be a next time)! I also will maybe reduce the dijon mustard amount because it seemed to overpower the cheese sauce just a little, but it could have been the type of cheese I used. 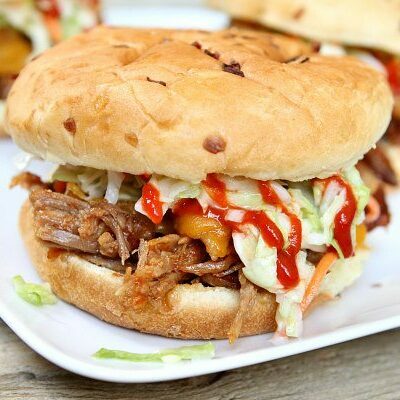 Thanks for all the great recipes you share! This is total comfort food! Love this mac & cheese! I could go for a great big bowl of this! I’m with you on pasta as a comfort food go-to! 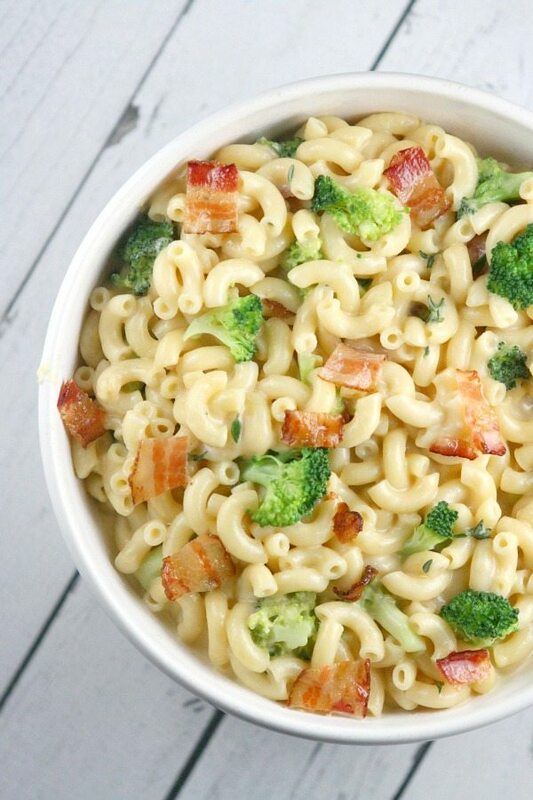 The broccoli practically cancels out the bacon and pasta, right?? 🙂 I love broccoli and bacon together. This looks fantastic! Thank you Lori for the nice recipe. Love this macaroni and cheese recipe!